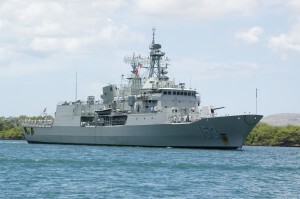 This HMAS Stuart (FFH 153) frigate is one of the units that belong to the Anzac-class. She was built at Williamstown in Victoria, and commissioned into the RAN in 2002. The frigate is fully operational as of 2015.
a beautiful shot of the Australian Navy ship HMAS Stuart (FFH 153) pulls into Pearl harbor for a scheduled port call before starting Rim of the Pacific (RIMPAC) 2006. Eight nations are participating in RIMPAC, the world’s largest biennial maritime exercise. Conducted in the waters off Hawaii, RIMPAC brings together military forces from Australia, Canada, Chile, Peru, Japan, the Republic of Korea, the United Kingdom and the United States. In April 2003, Stuart was used to capture Pong Su, a North Korean-owned freighter involved in drug smuggling operations. Accompanied by two police launches, Stuart intercepted Pong Su 90 nautical miles (170 km; 100 mi) off Sydney on 20 April. In 2004, Stuart was deployed to the Persian Gulf as part of Operation Catalyst. In February 2006, fire broke out about HMNZS Te Mana, Stuart ’​s sister ship, during an exercise off the coast of Australia. Te Mana ’​s Seasprite helicopter was diverted to Stuart, while the fire was put out by the crew. On the morning of 13 March 2009, Stuart was one of seventeen warships involved in a ceremonial fleet entry and fleet review in Sydney Harbour, the largest collection of RAN ships since the Australian Bicentenary in 1988. On 22 March 2011, while operating off Somalia as part of Combined Task Force 151, Stuart machine-gunned an unmanned skiff being towed by MV Sinar Kudus, a hijacked cargo carrier operating as a pirate mother ship.The skiff was destroyed. This was the first time an Australian warship had fired in anger at Somali pirates. On 11 April 2011, Stuart interdicted the Yemeni-flagged dhow named Al Shahar 75. A boarding party from the frigate rescued three crew members being held hostage, while the fifteen Somali pirates, who had surrendered as Stuart approached, were allowed to return to their skiff and sail to shore after their weapons and equipment were disposed of. In October 2013 participated in the International Fleet Review 2013 in Sydney, Australia. In November 2014, Stuart and sister ship Parramatta were deployed to shadow a Russian naval force operating in international waters off Australia during the 2014 G-20 Brisbane summit.The Russian deployment was believed to be in response to troubled recent relationships between the two nations. It was decided that the Stuart will be the last ship of the Anzac class to undergo the Anti-Ship Missile Defence (ASMD) upgrade. The upgrade will include the fitting of CEA Technologies’ CEAFAR and CEAMOUNT phased array radars on new masts, a Vampir NG Infrared Search and Track system, and Sharpeye Navigational Radar Systems, along with improvements to the operations room equipment and layout. Work will commence sometime in 2016, and is due to be completed by 2017.